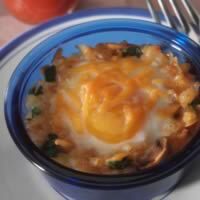 Hash browns, eggs, and vegetables are conveniently contained in cup-size portions. Heat oven to 350°F. Coat large non-stick skillet with cooking spray; heat over medium-high heat until hot. Add potatoes, mushrooms, and water; mix and spread in even layer. Cook, covered, 8 minutes. Turn vegetables over; cook, uncovered, until soft, about 6 minutes. Remove from heat. Add spinach, sour cream, 1/4 cup cheese, and dill weed; mix well. Divide mixture evenly among four greased 10-oz. ramekins or custard cups. Press an indentation (about 2-inch diameter) into center of mixture with back of spoon. Place on baking sheet. Break and slip an egg into each indentation. Sprinkle with remaining cheese. Bake in 350°F oven until whites are completely set and yolks begin to thicken but are not hard, 25 to 30 minutes.